Broadway Station is a gated community of condos just off 38th Ave North, about halfway between Hwy 17 Business and Bypass. 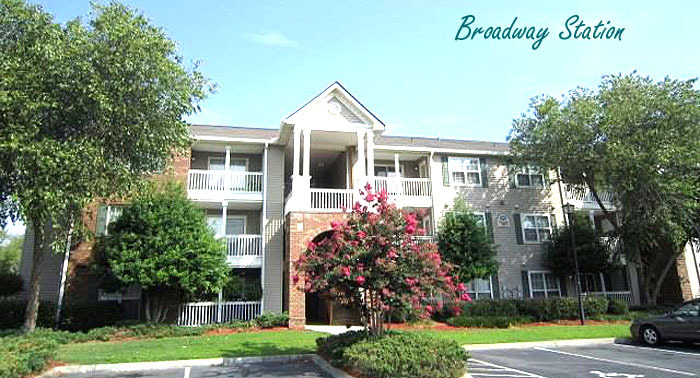 Originally a very sought-after apartment complex, it was converted to condos and renovated in the early 2000's. Amenities are excellent here, with a beautiful pool, clubhouse, hot tub, fitness center, and outdoor entertainment area. There are one and two bedroom condos, with amazing prices that start about $60,000 and are not much higher than $100,000. The location is great, just a short drive to the beach, and very close to the shopping center on 38th and Bypass 17, with banks, grocery stores, and several restaurants. It's in the very heart of Myrtle Beach, so it is convenient to everything, especially Broadway at the Beach, which it is named after. There's also a pond with fountains to add water views to many of the condos from the balcony. The units at Broadway Station are large and open, often with vaulted ceilings, hardwood flooring, granite countertops, fireplaces, and designer appliances. Some units have a garage. They make excellent long-term rentals as well as primary residences. Children will attend Myrtle Beach Elementary School, Middle, and High Schools. If you are looking for the perfect place to live (or find a renter) in the middle of Myrtle Beach's many attractions, you need to see these beautiful condos. Call us for a tour to see the available units. You'll be glad you did!